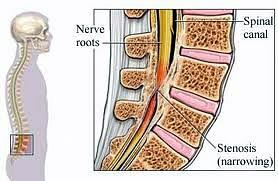 By definition, 'Spinal Stenosis' is a narrowing of the spinal canal, nerve root canal or intervertebral foramina of the spine compressing and blocking nerve roots. Wow, what does all that mean? Everyone has a different spinal cord and canal size, therefore, the risk factor of developing it varies. 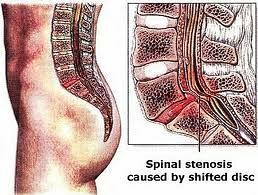 Stenosis can exist for years and may go undetected. During this time, one may not experience any pain or discomfort associated with the condition. Often, it is usually gradual and gets worse as the spine ages and with various spinal movements, or when a sudden fall or accident takes place that stenotic pain makes itself known. Generally, click here for general 'Spinal Stenosis' information. Specifically, click here for video 'Cervical Spinal Stenosis'. Not as common as lumbar stenosis in the lower back or cervical stenosis in the neck, thoracic spinal stenosis is a rare degenerative condition... click here for video 'Thoracic Stenosis'. However, the most common area of spinal stenosis includes the L4/5 region of the lumbo-sacral spine (low back)... click here for video 'Lumbar Spinal Stenosis'. Patient education and awareness to have patience as 'It Takes Time to Heal" most conditons... click here for further information.